South African activists have been fighting hard for renewables – and against a corrupt nuclear deal. And in April, their efforts paid off when the state utility’s plan for nuclear power was declared unconstitutional. Harmut Winkler sums up the consequences. A South African court has ruled that critical aspects of the country’s nuclear procurement process are illegal and unconstitutional. The outcome is a significant setback for a network of entities that had been aggressively promoting a 9.6 GW nuclear expansion programme in the face of popular opposition. Over the past four weeks controversy over the proposed nuclear build has reached new highs. This was sparked by a major cabinet reshuffle in which President Jacob Zuma ousted both his finance and energy ministers, replacing them with individuals regarded as pro-nuclear. 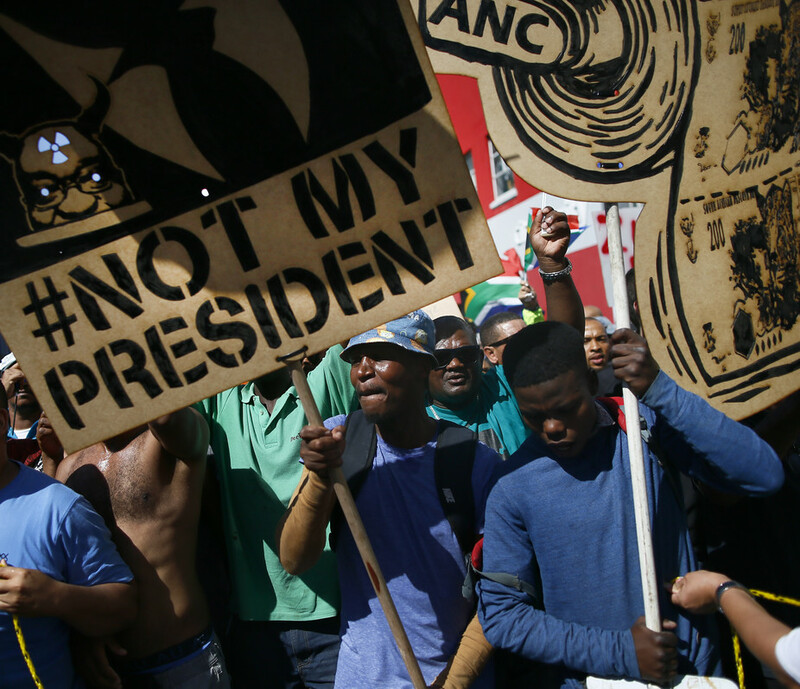 The reshuffle prompted some of the largest and most diverse street protests since the dawn of the country’s democracy in 1994. While many factors contributed to the outpouring of public anger against the president, the nuclear question was a common motif in the protests. Opposition to the nuclear expansion programme centred on two points: the first was its prohibitive costs – some estimates put it at R 1 trillion which is roughly equivalent to the government’s total annual tax revenue. The second is that it has become contaminated by allegations of corruption, with evidence pointing to politically connected groups and individuals benefiting handsomely from it. The court’s ruling in effect means that the planners will have to go back to the drawing board. The case in the Western Cape High Court was brought by two civil society organisations, Earthlife Africa and the Southern African Faith Communities’ Environmental Institute (SAFCEI). The most far reaching aspects of the judgment were that it overturned ministerial proclamations made in 2013 and 2016 that enabled the development of 9.6 GW of nuclear power. It furthermore invalidated the intergovernmental nuclear collaboration agreements South Africa had signed with Russia, the US and South Korea. The court’s ruling on the promulgations was damning and unambiguous. South Africa’s Electricity Regulation Act requires the Minister of Energy to promulgate any energy generating capacity expansion through the National Energy Regulator of South Africa (NERSA). The regulator is required to vet the proclamation to ensure that it is in the public interest. The Minister of Energy issued two promulgations to establish 9.6 GW of nuclear energy generation. The first one was concluded in 2013 but only made public two years later. The second one, which delegated the nuclear procurement to the state electricity utility Eskom, whose leadership is strongly pro-nuclear, was hurriedly and stealthily implemented in 2016 on the eve of the first sitting of Western Cape High Court on the matter. Neither of these proclamations allowed a public participation process. The court ruled that both promulgations were illegal and unconstitutional. It found that the regulator had failed to carry out its mandate because it had endorsed the minister’s directives uncritically and hurriedly. In doing so it had not allowed public input nor had it considered the necessity of the nuclear build or the consequences of its delegation to Eskom. The court was equally clear on the collaboration agreements. Unlike the relatively vague agreements concluded with the US and South Korea, the Russian agreement had a great deal more detail in it. It specifically committed South Africa to build nuclear power plants using Russian technology, set out a timeframe and placed specific liabilities on South Africa. South Africa’s constitution stipulates that international agreements that will have a substantive impact on the country must be approved by parliament. The agreement with Russia clearly falls into this category and therefore needed to be submitted to parliament for debate and approval. It follows that the Minister’s decision to table the agreement in terms of section 231(3) was, at the very least, irrational. At best the minister appears to have either failed to apply her mind to the requirements of sec 231(2) in relation to the contents of the Russian IGA or at worst to have deliberately bypassed its provisions for an ulterior and unlawful purpose. This could open the door for further action against the minister as well as Zuma, who, according to the court papers, instructed her to sign the Russian agreement. The US agreement was concluded in 1995 and the South Korean agreement in 2010. But they were only presented to parliament in 2015. The court declared them invalid in view of the inexplicable time delay. A judicial appeal is widely expected. But it’s unlikely that the government will succeed in overturning the essence of the judgement. And an appeals process will delay any legitimate future nuclear power procurement. Any attempt to re-initiate a nuclear build would have to start from scratch. Based on the judgement it can safely be assumed that the regulator can only endorse nuclear expansion if it can demonstrate that it’s necessary and that it’s a better solution to any other energy option. But given the prevalent suspicion around the nuclear expansion, the regulator will be hard pressed to show that the nuclear option is in the public interest. It is therefore unlikely that any nuclear development will succeed in the foreseeable future. Hartmut Winkler is a Professor of Physics at the University of Johannesburg. Disclosure statement: Winkler receives funding from the NRF. He is a member of Save South Africa and OUTA, but writes this piece in his personal capacity. Good. The shrinking band of nuclear fans should consider the consequences of this ruling for South Africa’s carbon emissions. Electricity from nuclear reactors costs at least twice as much as that from wind and solar in LCOE, on best-case assumptions for the latter (Lazards). The gap is narrowed if you add in grid integration costs, but these are significant for coal and nuclear as well, when large chunks of capacity can be lost at one time if there’s a breakdown or safety shutdown. It follows that for the same money, South Africa will be able to build considerably more effective renewable capacity, more quickly, and get sooner on a path to reducing its emissions from coal. Correction: best-case assumptions for nuclear, not for wind and solar, which are based on direct observation. Next PostThe US (and Australian) nuclear camp critiques studies for 100% renewables. Without reading them.